The Uralhimmash Plant in Yekaterinburg has signed a contract to manufacture and supply around 85 tons of equipment for the Kudankulam Nuclear Power Plant in south India, the Ministry of Foreign Economic Relations of Sverdlovsk Oblast said. Yekaterinburg’s Uralhimmash Plant has signed a contract to manufacture and supply equipment for the Kudankulam Nuclear Power Plant in the southern Indian state of Tamil Nadu. 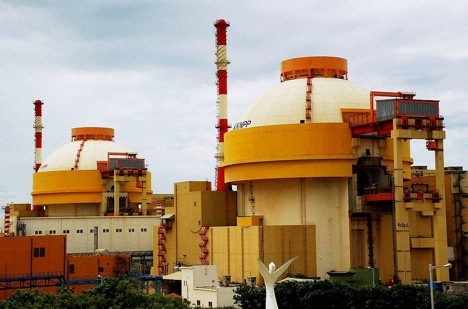 “The plant will supply eight containers for the reactor’s emergency cooling zone for the third and fourth units of the Indian nuclear power plant,” the Ministry of Foreign Economic Relations of Sverdlovsk Oblast said. The amount of the contract was not disclosed. These containers are used to automatically feed cooling solution containing boric acid into the reactor core during emergency depressurization of the first circuit. The equipment weighs about 85 tons. Delivery of this equipment is scheduled for 2017. Uralhimmash has produced equipment for nuclear power plants in the past. During the Soviet era, the factory made steel structures for Ignalina, Kursk, Leningrad and Smolensk NPPs. “Later, for the Research Institute of Atomic Energy, the plant manufactured unique equipment for conducting experiments on the interaction of liquid sodium with enriched uranium. In 2009, for the construction of the BN-800 reactor of Beloyarsk NPP, the plant manufactured and supplied equipment for the second loop of the reactor, the total weight of shipments amounted to almost 1,000 tons,” officials noted at the ministry. “Sverdlovsk Oblast is prepared to expand ties with India in various areas; energy, mechanical engineering, mining, computer technology, health and education,” said Governor Yevgeny Kuyvashev. The governor’s information department added that in 2014, India occupied 12th place among countries that were trading partners of the Sverdlovsk Oblast, with a total turnover of more than $260 million. Of this, exports amounted to $229 million, and imports $32 million. Sverdlovsk Oblast supplied to India mainly ferrous metals, building materials, engineering products and equipment. From India, the Oblast imported ferrous metals, electrical machinery, tools and medicines. It is expected that India will become a partner country of the annual Innoprom International Industrial Exhibition, which will be held in the summer of 2016 in Yekaterinburg.